In what is the latest ‘Meet the Expert’ event at Dundee Science Centre, the event will run from 10am until 4pm and is included as part of normal admission. Those taking part include Scott Menmuir, Dundee Community Safety Constable from Police Scotland, who will be bringing some police gear for children to try on, as well as a real life scenes of crime (SOC) kit. He will be joined by Robert Humphreys, Clinical Teaching Fellow from University of St Andrews, who will be demystifying the role of GPs alongside Henry Rae, also from University of St Andrews. 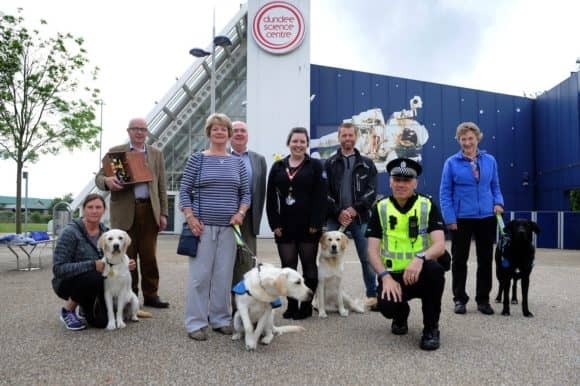 Meanwhile, both two and four legged representatives from Guide Dogs for the Blind will also be on hand to showcase their role in keeping blind and visually impaired people safe and well, through various demos and blind-folded walks. Other experts will include Ayman Mustafa, Consultant Anaesthetist from Ninewells Hospital who will demonstrate some real-life kit used in anaesthesia, while answering the public’s questions on the topic.